There is no reason to play a golf course that is too long for you. Just move up a set of tees. If you are ever in a situation where you have to play from tees that are too long, here is how to do it. First, realize that you will shoot a score that is higher than you usually do. Accept it and do not concern yourself with your score as you play. Just play golf. Add it up when the round is over. Second, control the ball. You must get the ball in the fairway off the tee, and keep it there. If a long par four will be a three-shotter for you anyway, make them three easy shots. Let’s say that you don’t want to, or can’t, hit a 437-yard par 4 in two. Back way off and make them three easy shots. You can get there with two 5-irons and a pitching wedge. Leaving your driver home might not be a bad idea. Third, avoid trouble around the green. Know which is the longest club you feel sure that you can hit the green with. Now add three clubs. If you have to hit that club or more to get the ball on the green, lay up if there is lots of trouble around the green you could hit into. Fourth, if you know you’re going to use up an extra stroke to get to the green, hit that third stroke from a distance you’re very good at. Let’s say you own the 75-yard pitch. Plan your attack so your second shot ends up 75 yards from the pin. Fifth, your short game goal is to get the ball on the green. From inside 100 yards, you dare not take two shots to get the ball on the green. Forget the pin; aim for the center of the green. The longest approach putt you might have is 40 feet, and they will likely be much shorter than that. Finally, since you’re using up extra shots to get the ball on the green, you just have to get down in two putts once you’re there. There are no shortcuts here. You’re giving away strokes in the fairway, you can’t give up any more on the green. Uppermost, never let the added length lure you into trying to hit the ball farther than you can. Stick to playing your game and be happy with the result. 1. Last fall, I developed a killer chipping method using primarily my wedges. It worked well through late spring. We’ve had a period of hot weather recently which dried out the courses in the area. That chipping system had to be put on the shelf because the ball isn’t checking up on the firm greens. It’s back to my 6-iron for the garden variety greenside chips. 2. Also, greenside rough is behaving differently, so I found the solution by putting away my wedges and chipping out with a 24-degree hybrid iron. The ball comes off that club pretty hot, so it takes a bit of practice to learn how much touch to put on the ball. 3. I have a confession to make. I can miss really short putts. I would rather have a four-footer than a two-footer. For some reason, my mind’s eye doesn’t define the line to the hole on the short putts and they can go anywhere. My solution? Line up the putt, close my eyes, and make a pendulum swing with my shoulders. Works like a charm. The U.S. Open is my favorite golf tournament. The Open Championship is 1A, and when I watch it, I actually like it better. Maybe only national pride keeps our Open at the top of my list. 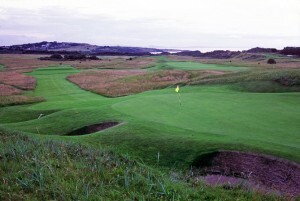 I love the ground game, the way links golf asks you to get the ball up to the hole however you can. Imagination is king, which is the way I like to play. The Honourable Company of Edinburgh Golfers owns the course which hosts the Open this year — Muirfield. 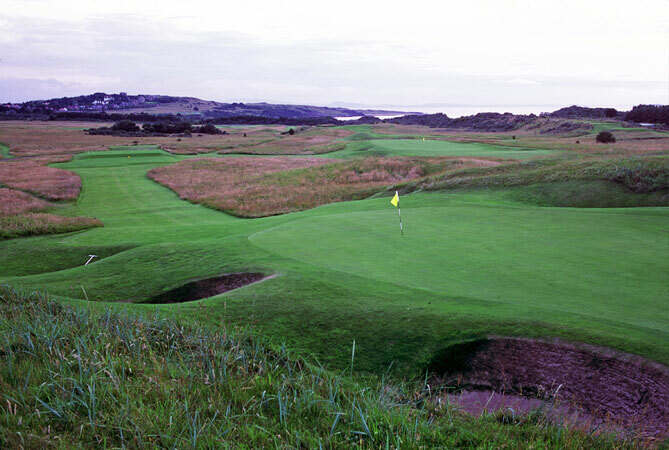 Though St. Andrews is the older course, the Company is the oldest golf club in the world, dating from 1744. It also composed the original 13 rules of golf upon which the modern rules were founded. Every course has its own character, emphasizing one part of the game over the others. Muirfield is a driver’s course. There is no water, no trees, no carries. Just get the ball in the fairway, or else. Another strength of the course is its bunkering. The landscape is designed to collect balls into bunkers that are intentionally penal. Shown below is the 13th hole, a 190-yard par 3. The green is quite narrow. The bunker on the front left is six feet deep. The outward nine circles the perimeter of the course, running counter-clockwise, and encloses the back nine, which circles clockwise. Wind is another of the course’s defenses, and only at holes 3, 4 and 5, and 10 and 11 do consecutive holes run in the same direction. Muirfield plays to a fairly short 7,192 yards. It has no hole that you might call a signature hole. Every hole is a challenge. The opening hole is 447 yards long, but against a headwind getting on in two can be difficult. The second hole is only 364 yards long, but players will need an iron to keep the ball in the fairway, and the green has no real landing area as it slopes away from you. Combining an army of bunkers on the right side of the green with out of bounds hard on the left, what looks like a birdie hole could surprise more than a few golfers. On and on it goes, just like that. Every shot must be carefully thought through up to the closing hole, a brute of a par 4 at 470 yards. Like at Merion, a leader nursing a one-shot lead on the 72nd tee will be examined fully. Who is the favorite? Phil just won in Scotland. Tiger is coming off an injury and is an X factor. Rory could pop out of nowhere and have four greats rounds, but I’m not holding my breath. What I can say is that no slackers win the Open at Muirfied. Its post-war winners are Cotton, Player, Nicklaus, Trevino, Watson, Faldo (twice) and Els. We should expect no less this year. I know that every one of you has a pretty good swing. You can use it to get the ball in the fairway, and get the ball on or near the green. But for some reason you don’t. That’s because you get caught up by the #1 swing wrecker in golf — the ball. Take four practice swings, without rushing, but take four practice swings in a row. Seems simple. Now step up to the ball. Did something change? Did knowing that you were going to hit a ball cause you to think different thoughts, or even have a different state of mind, if you are sensitive to those things? If so, what’s killing your golf is not some technical flaw in your swing, but the way you use your mind. The ball cannot change things. It just cannot. Your swing is the same whether there is a ball there or not. When you make your practice swings, you have an expansive, unconcerned state of mind. It feels good. It feels capable. It feels right. I believe the major golfing skill, more important than any other, is to maintain that state of mind when you are about to hit the ball. If you can, you will play the best golf you are capable of. You will play up to your technical limits, and that is all you can ask of yourself. Here’s a drill to teach yourself how to do that. Be warned, this is a very difficult drill — and I’m not kidding. Put a ball on the ground. Now step back a bit and take four or five practice swings. Swing enough times so that the thought of hitting a ball has vanished from your mind, and all you feel is the motion of your swing. Now step up to the ball and address it. If you switch to thinking about hitting the ball, stop. Don’t make another move. Step back and take more practice swings until “hit the ball” leaves your mind. Step up to the ball once more. If you start thinking, “hit the ball,” step away and begin again. At some point, you will decide that the ball is not worth all the time you are wasting, and you’ll decide to get it right. When that happens, you will have taken the first step to learning that the ball is not in control — you are. Keep going and take more steps. Having one experience is not enough. To get the most out of this exercise, you should do it all the time, and make it your principle golf drill. Now I want to add on another condition. If at any time you think, “hit the ball,” stop and start over. Not just at address, but during the swing. If you’re starting your downswing and you think about the ball, stop. Do not complete that swing. If you do, you will reinforce the wrong feeling. You’re teaching yourself to hit the ball without having hitting the ball in mind. You will teach yourself to do that only if that is your state of mind. What am I saying? I’m saying this: when you eat your cereal in the morning, you don’t think at all about your spoon, or the cereal you’re loading on to it, or getting the spoon into your mouth instead of hitting your chin. You just scoop up some cereal and eat it. That is the same state of mind you need to be in when you hit a golf ball. That’s what this drill will teach you if you stick with it. I believe that the more time you put into learning how to do the drill correctly, the better it will be for your golf. Chipping to a green that slopes away from you is easy. It’s all in the setup. Since the club is not hitting through the ball, the chance of blading the ball is reduced to virtually zero. You can hit this shot almost any distance, not just the shortie you see in the video. Every time you hit a golf ball, there should be a purpose. At the driving range, you can hit balls with no other purpose than building positive habits to serve you when you play. What would be the habits you might wish to develop? The first one, which should be shared with what follows, is the feeling of mind that the shot is within your capability to hit well, and that it will be hit well. Train yourself to have that feeling every time you step up to the ball. Do not take for granted. Make that feeling explicit, part of your emotional checklist you go through before you take the club away. When you play, don’t you want to have a confident feeling like that when you’re about to play a shot that counts, as confident over a drive into a narrow fairway as over a six-inch putt? Of course you do. You can have that feeling if you have trained yourself to have it, by making it a natural response to hitting a golf ball, regardless of the situation. You need technical skills, too. Good golf is played by hitting the ball the right way, the same way, every time. Please take lessons to learn what the right way is. Very few of you are genius enough to figure it out by yourself. Once you know what the principles of good golf are, practice those principles, and only those. Hit each ball with one thought in mind, the same thought. If you hit the ball poorly, take it to mean that you haven’t learned the principle yet. The mistake is to think it doesn’t work, and then go fishing for something else. That leads to one thought after another, ending up in having learned nothing, and having established a habit of guessing over the ball. While the emotional confidence you are trying to build up shouldn’t be influenced by your circumstances, when you really don’t know what you are doing, it’s hard to maintain your confidence; because you are believing in, what? So practice your technical point using practice swings, enough of them so you feel you have it down, and then step up to a ball with the feeling that you know what you are doing and that it will work. The ball cannot be a test to see whether you know, but a confirmation that you truly do. If the shot works out, repeat the whole process. If it doesn’t work out, chalk it up to needing more work, then go do the work. In the end, this is true: While you want to have all parts of your game polished as well as you can, a positive mind will serve mediocre technique much better than flawless technique will serve a mind that worries. Because the mind is intangible, we tend to forget its influence. Those who remember are the ones who get the most out of their skills and have the most fun. There is a simple way to hit your approach putts on the number. It involves knowing what physical impression the stroke for a certain distance makes on your body. I spoke of this in an earlier post, but this post goes into more detail. This method works only if your putting stroke is a body stroke; that is, the rotation of your torso is the prime mover of the stroke. If you are all hands on the green, read no further. Go to the practice green and hit several fifteen-foot putts. As you hit these putts, pay attention to any physical sensations you have at the apex of the stroke. For example, I feel certain compression of my upper back muscles on my right side. What you have found is the physical feeling, for you, of a fifteen-foot putt. Now whenever you recreate that feeling, the putt will go fifteen feet. Simple. Now make a longer stroke, one that hits the putt twenty-five feet, and look for the physical marker again. For me, it’s a stretching, or maybe a tugging, in the right side of my torso. Finally, hit some putts that go thirty-five feet. When you have that distance down consistently, search once more for the indicator physical sensation. I feel a stretching or tugging sensation in my lower back. After you’ve done this, you have found three reference feelings that produce approach putts of three definite lengths. Given a putt of that length, you merely have to reproduce the feeling as you make the stroke and the perfect distance is the result. For putts between those reference point distances, use the feeling of the shorter stroke and add on a bit of hit with the hands. For putts of longer than your longest reference stroke, you do the same thing–add a bit of hit with your hands. Practice will tell you how much. If you calibrate your stroke in this way and memorize these feelings, there is no need ever to guess at how hard to hit an approach putt. Golfers of a certain vintage know that the modern golf ball helps us hit the ball farther than we could with a wound golf ball. Jack Nicklaus wants to change all that. He wants to dial back the ball by twenty percent, not just so the pros won’t hit it so far, but so all of us, you, me, we don’t hit it so far, either. And he thinks that would be a good thing. Yesterday I watched the David Feherty interview with him. Nicklaus was talking about 17,000 courses that would be brought back into play if the ball were to be contained. Too many courses have to be 7,000 yards. That takes too much land, too much water, too much time to play. If courses measured 5,600 yards that would get more people on the course, conserve resources, be more fun. It’s not that Augusta has had to lengthen itself by 500 yards in order for it not to become obsolete, he said. It’s all the courses. What’s wrong with a course that was built for a different age gracefully aging out of competition, somewhat like Nicklaus himself did? Here’s the question I have for Jack. The very first course I played was Eastmoreland Golf Course, a municipal course in Portland, Oregon. I still play there. It was built in 1928, so it is not a case of using excess land to build a modern course. It’s there, nothing is going to change. Length from the white tees is 6,106 yards. Not excessive by any means. The second hole, though is par 4, 427 yards. When I was in high school (mid-1960s), it was the same length. I have a scorecard from back then to show it. Now when I was in high school, I hit my a driver and a 3-wood, and I still wasn’t up to the green. This hole was a three-shotter for me. Now, a drive and a 21-degree hybrid get me on. Tell me, Jack, how is dialing back my distance so this hole becomes a three-shooter again going to make my golfing experience better? My best drives go 235 yards. How is cutting that back twenty percent, so I can only drive the ball 188 yards, going to let me have more fun? Leave our game alone. It’s fine the way it is. The scary thing, is, though, dialing back the golf ball could well be the USGA’s next itch to scratch.